Private Lessons are 45 minutes to one hour long. Semi-privates (two riders) are one hour long. Group lessons (three or more riders) are between one, and one and-half hours long. $50 per individually scheduled lesson. Package fees are paid at the beginning of the month by the fifth. Missed lessons without 24 hours notice are forfeit. Missed lessons with notice may be made up within four weeks. Multiple reschedules cannot be accommodated with reserved horses and ride times. continued/multiple cancelations will result in the reserved time being filled with another rider, and student may continue with lessons on an individually scheduled format. $200 Four lessons per month with a reserved lesson time. This includes the use of horse, all tack, Grooming tools, and the use of an ASTM approved helmet. The student is encouraged to purchase a helmet of their own if they desire to continue lessons on a regular basis. $360 Package of two lessons per week. $500 Package of two lessons plus one independent practice ride per week. Rider must be cleared for independent riding by trainer. LEASES ARE AVAILABLE ON DOUBLE M SCHOOLING HORSES. PLEASE INQUIRE ABOUT DETAILS. Lessons are available at locations in the immediate vicinity of Talent. Travel fees may be split among multiple riders. All students must wear closed toe shoes when in the stable. No sandals or flip-flops will be allowed near the horses. Students must wear hard shoes or boots with heels for riding, and ASTM approved helmets when mounted. 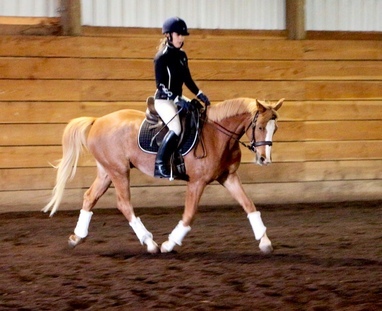 Half-chaps or tall riding boots are needed for correct leg position. Please contain long hair in tidy hair bands or hair net.